One facet of IP’s Lifelong Committee’s Sidewalk Subcommittee undertaking includes surveying all our neighborhood’s sidewalk ramps – or lack thereof. This is being done in conjunction with a Georgia Tech Sidewalk study and utilizes GT’s expertise and equipment. It’s a significant undertaking that may take several months to complete, as there are many ramps or potential ramp sites to be surveyed. 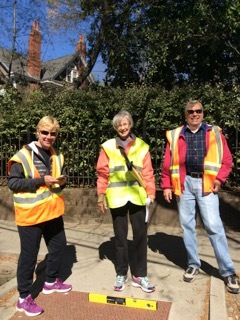 Your neighbors Melissa Miller, Sandy Hoke and Marge Hays, sporting safety vests and toting measuring devices, have begun congregating at various corners for this purpose. Based on one of the measurements to be taken, we have dubbed ourselves The GutterSlopes. We measure up and we’re on the level! What can you do? Actively Participate!